Just when you thought that the Coalition could not be any more grubby, Malcolm Turnbull has announced that he intends to ban any refugee or asylum seeker sent to an offshore processing centre after 19 July 2013 from ever coming to Australia. Turnbull’s ban would prevent such people who arrived by boat from ever applying for a valid visa to enter Australia. It would prevent families from re-uniting; and prevent them ever getting a tourist, business, study visa or anything else. It is an extraordinary and desperate proposal from a government that is now more unpopular that Tony Abbott’s. As the government and Turnbull have fallen in the polls, Turnbull has turned to refugee-bashing. Turnbull’s hope was that Labor would simply back the government’s latest anti-refugee announcement, as they have so often done before. But his attempt to cast himself as the Donald Trump of Australian politics might be coming unstuck. The proposal has all the features of the policy overreach that Abbott was famous for, before he was tossed out. Some people thought Turnbull’s ban might be part of a tricky move to find “third countries”. But there are no third countries. Typically, The Australian newspaper planted a booster story for the government suggesting that some “third country” options could be announced “shortly”. But there is no substance. All the paper said was that it “understood” from “sources” that some suggested countries are “in the northern hemisphere…” Really?! 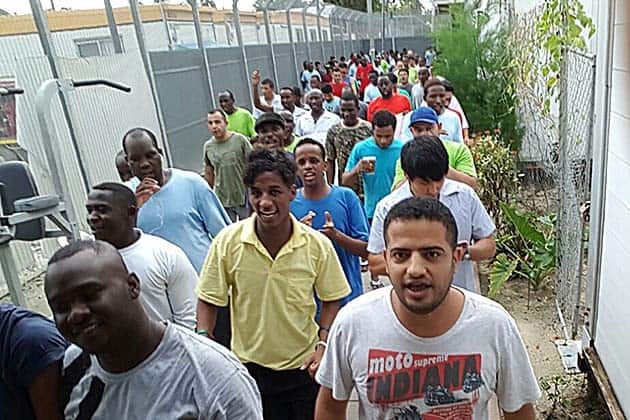 The President of Nauru and the PNG Immigration Minister both used the recent UN refugee summit to appeal for international help to resettle refugees. It was a slap in the face for Peter Dutton and proof that there are no third countries considering settling the refugees Manus and Nauru. Dutton could not name any third country and all Foreign Minister Julie Bishop could say was that the government is looking for third countries “all the time”. Bill Shorten has called the proposal “ridiculous” and attacked Turnbull for following One Nation’s lead. But we are still waiting for Shorten to say that Labor will reject Turnbull’s lifetime ban bill. But there are stronger noises from some other Labor politicians. Even Labor’s architect of the Pacific Solution II, former Prime Minister Rudd, has called for Turnbull’s ban to be opposed. Tasmanian Labor Senator, Helen Polley, previously a supporter of Labor’s official policies of offshore processing and turnbacks, called Turnbull’s proposal “outrageous”. However, “feeling sad” won’t stop Turnbull. The Greens have declared they will oppose the lifetime ban. What’s needed is a definite commitment from Labor that they will vote against the ban and kill the bill. The Coalition government is also desperate to pre-empt an upcoming decision of the PNG Supreme Court which found in April that the Manus detention centre was unlawful. Almost 900 people are still held there. After dismissing an application by Manus detainees in October on a technicality, the PNG Supreme Court is again set to consider, as early as December, a renewed application for compensation for human rights breaches and orders that all Manus detainees be returned to Australia. Contrary to Peter Dutton’s repeated claim that no one who has been sent to Manus Island or Nauru will ever come to Australia, that possibility is closer than ever, as the government runs out of options and its offshore detention regime sinks further into crisis. The Nauru files exposed the scale of abuse and the government’s deliberate policy of neglect. The demonstrations in Sydney and Melbourne on 5 November could not come at a better time. The government has already been forced to exempt medical workers from the Border Force Act ban that prevented them speaking publicly about conditions they witness in detention.A recent Australia Institute poll showed over 60 per cent were in favour of bringing offshore refugees to Australia. Defeating Turnbull’s bill can help turn the tide in the campaign to end offshore detention and to bring all those damned to Manus and Nauru for over three years, to Australia.